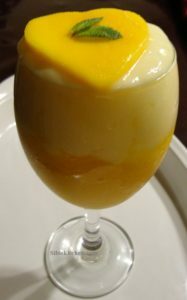 A wonderful dessert made with the king among the tropical fruits- Mango.Chill it atleast 2-3 hours before serving. 1) Peel mangoes, cut fruit from pits and puree in blender or food processor. 2) You should have about 4 cups of puree. 3) Transfer puree to a large mixing bowl and stir in the sugar and evaporated milk. 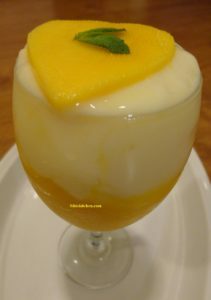 4) Prepare the gelatin according to package instructions and whisk it to the mango mixture. 6) Top with chilled vanilla custard while serving.